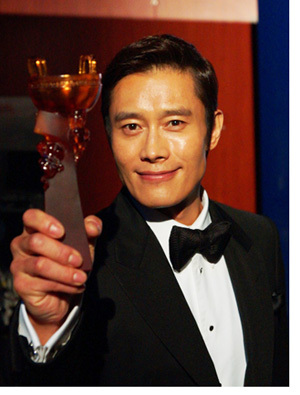 LEE Byung-hun has cemented his status as the biggest star of the year in Asia by winning the Best Foreign Actor Award at the 9th Huading Awards, the most influential awards ceremony in Greater China. LEE, acting as Storm Shadow in G.I. Joe: Retaliation, attended the ceremony at the Kowloon Bay International Trade and Exhibition Centre in Hong Kong on April 10th to grab the trophy. The Huading Awards, which has reached its 9th edition this year, is an awards ceremony with features guests from the Chinese region, including China, Hong Kong, Taiwan, Singapore and Macao in attendance. Among the guests were LEE and HAN Ga-in from Korea. Huge names in Great China Region such as Jackie CHAN, Andy LAU, Simon YAM, Nicholas TSE, and FAN BingBing also caught attention from visitors. HAN, along with YAM who appeared in The Thieves, were there to hand awards to winners. As his name was called, LEE walked on stage and said, “I am grateful to all the fans in Korea and in the world who have enabled me to achieve all I have done. I am especially thankful to Jackie CHAN, my childhood hero and the greatest action star.” After he said so, CHAN gave him a warm hug and other stars gave them a round of applause. When FAN BingBing received her Best Actress Award, he taught her “Be Happy” in Korean as he hande her the trophy.